Looking for a unique and impressive gift? A gift voucher is the perfect answer! 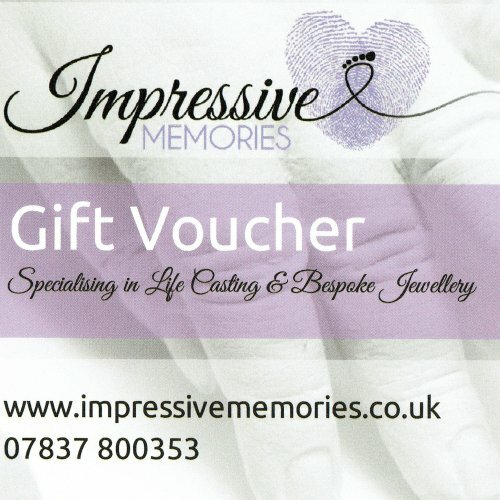 When you buy a gift voucher you allow the recipient to chose their own impressive memory to create…whether they’d like 3D casting, bespoke jewellery, ceramics…the choice is theirs. Once you purchase a voucher, drop me a message, [email protected], if you have any special instructions, and let me know where you’d like your voucher posted to…and I will do the rest. Vouchers are valid for 12 months from purchase. Buying early as a gift? If you are buying a voucher to give to a new baby, before they’ve been born…just let me know and I will date your voucher appropriately…same goes if it’s for a Christmas present…all part of the Impressive Gift Voucher service! !